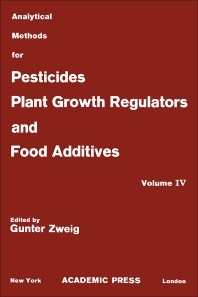 Analytical Methods for Pesticides, Plant Growth Regulators, and Food Additives, Volume IV: Herbicides contains detailed analytical procedures for analysis of 30 different herbicides and plant growth regulators. Each chapter of this 27-chapter volume covers the chemical and biological properties, history of development, methods of synthesis, and modified residue methods for different crops. Each chapter presents first the general information, followed by intensive discussion of the methods of occurrence and residue analysis. Methods of analysis covered in each chapter include chemical methods, gas-liquid chromatography, colorimetry, and enzymatic techniques. Agriculturists, analytical chemists, and toxicologists will find this book rewarding.